How Will Harvey Impact the U.S. Economy? By now, you’ve surely watched with sympathy and concern as hurricane Harvey flooded America’s fourth largest city. You may remember seeing similar footage when Hurricane Katrina roared through New Orleans, and when superstorm Sandy roared through the most populous areas of New Jersey and New York. Seeing Houston sitting in six feet of water may lead you to wonder what the economic impact will be of all this devastation, and how it compares to natural mega-disasters like Katrina and Sandy. 2) in the end, the storm will actually have minimal impact on the overall economy’s growth. 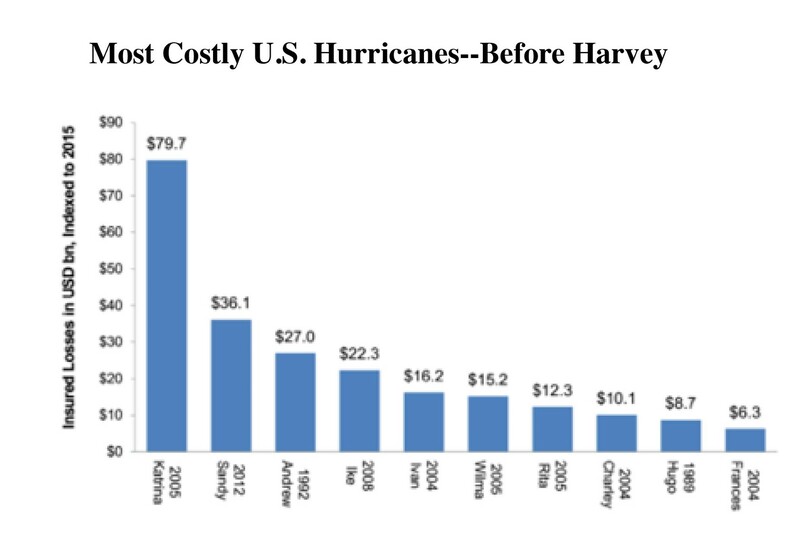 You can see in the accompanying graph that either estimate would make Harvey the costliest hurricane in U.S. history. But where will the impact be felt? First, at the pump. The American Automobile Association reports that the average cost of a gallon of regular unleaded gas jumped from $2.34 to $2.40 in a matter of days, due to shutdowns that have slowed the flow of gas from the epicenter of Texas’ oil refinery industry. (The Houston area processes nearly one-third of America’s crude oil.) Interestingly, crude oil prices are falling due to lessened demand; because refinery companies are no longer buying oil on the spot markets while they rebuild and retool. The Houston area also has a lot of facilities that use petroleum to manufacture a variety of chemicals for export—roughly 21% of the U.S. total. Disruptions to chemicals-related exports could reduce GDP in the fourth quarter by as much as 0.20%. We can also expect a brief spike in initial jobless claims—the weekly tally of people who file for unemployment benefits for the first time. 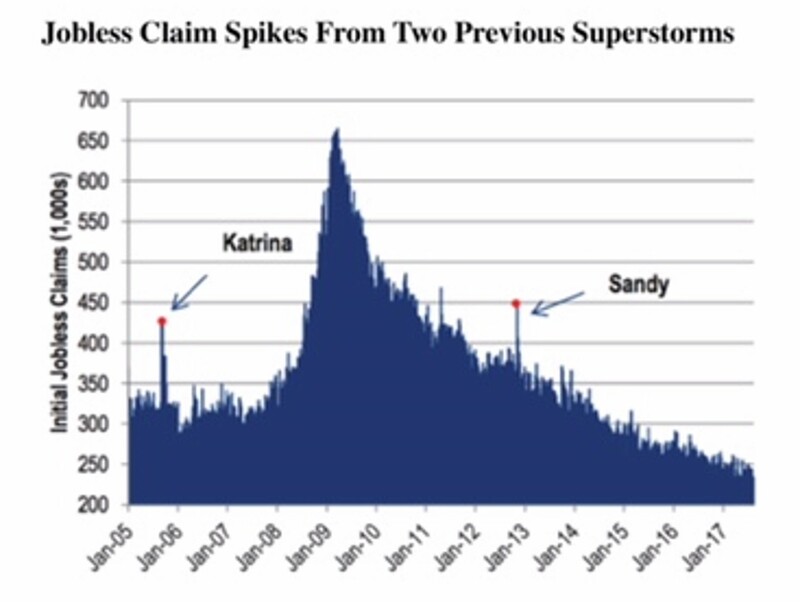 Economists note that there was a spike in initial claims in Louisiana after Hurricane Katrina, and in the Northeast after Hurricane Sandy. If the past is any indication, this will be a VERY temporary phenomenon (see the jobless rate graph), because the cleanup in the aftermath, including a lot of repair and construction, will require a lot of temporary labor, reducing the local unemployment rate, for a few months, to near zero. Meanwhile, up to half a million flooded cars and trucks could be scrapped, according to an estimate by Cox Automotive. Auto insurers like State Farm, Allstate, Progressive, Geico will deal with claims for several months. Harvey taketh away, but it will also give back: the impact of devastation on the overall economy will be somewhat offset by the huge rebuilding effort’s impact on overall GDP. However, the final tally, as mentioned, won’t be measurable until the rebuilding has been mostly completed—which won’t be anytime soon.